Being so rich in viticultural treasures, I felt that the Orange county region requires a little bit more attention. To this end, continuing in last week's vein, I have here outlined my experiences at a couple more of the area's fine wineries. 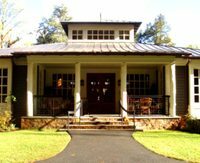 A few miles up Route 22 as it winds its way from Charlottesville, just over the border into Albemarle County, signs pop up in the green pastures for Keswick Winery. The winery is set a good ways off the road up a long and winding path, and our drive up said path was like being transported into some pastoral poem. To the left, farm dogs frolicked amongst the vines, while rabbits popped their heads in and out of their warrens; to the right, gnarled fruit trees stood stark in the tall grass, and on an a small and swampy looking pond, a Great Blue Heron made a majestic marine landing. Hand to God. Up on a nearby hill, set behind a copse of trees, a large barn-like structure houses the very modern tasting room. Inside, a large L-shaped tasting bar dominates the large, dark-wood furnished room, otherwise occupied with books, T-shirts, and other tasting room knickknacks. Near the door is a fascinating little glass table displaying artifacts uncovered during the vineyards' planting. Being rather early on a Sunday the place was empty, so we were eagerly greeted by the two young women behind the bar, probably happy for the diversion. We chatted pleasantly as we paid our $8 and sampled the ten or so wines being offered that morning, most sourced exclusively from the surrounding 40 acre Edgewood Estate Vineyard. The 2006 Rose was lovely -- light, with just a hint of sweetness on the raspberry fruit palate. By and large the whites did not impress me, but it was interesting to see that Keswick grows the Spanish varietal Verdejo -- several VA wineries have been experimenting with this suddenly popular varietal; expect to see many more in the near future. The reds were solid, if a bit lower in acidity than I would have liked. The 2006 Norton was rather impressive, though, showing a classic profile of burnt fruit and earth, a full body, and none of that grapey or foxy quality for which the grape has been derided. We picked up two bottles for $20 apiece. While there is not much in the way of food to be had, Keswick makes some good wines that you may consume in undeniably gorgeous environs. If you find yourself in the neighborhood, pack a picnic and pay a visit. I have only visited this winery once, and briefly, but I certainly plan on visiting again. It was kind of late on a Sunday, and after a rather lengthy tasting at Barboursville, I thought it would be a good idea to see what Horton was about, being only a few miles up the road. As it was threatening rain and about 20 minutes till closing, my companions disagreed. After a bit of whining, I got my way. We pulled up to the tasting room just as the drenching rain began, and rushed under useless umbrellas to the welcoming Tudor style miniature castle. Inside, the tile floored, vaulted ceilinged room was a bustle of activity, with four tasters running back and forth serving some 20 or so guests. I soon learned what all the commotion was about: Horton offers their entire portfolio, 40 wines strong, open for tasting, free of charge. With only about 15 minutes to taste and so much on hand, we quickly moved through a few solidly made fruit wines and then went for the dry reds. The Stonecastle Red, an unusual blend of French and Portuguese varietals, was a pleasant surprise — lots of gamey flavors and depth of fruit given the light body and $12 price tag. The Cotes d'Orange, a cleverly named Cotes du Rhone inspired blend was similarly appealing, though a bit more tannic than its brother. The Malbec, an almost unheard of grape to see at a Virginia winery, was much lighter than its South American counterparts, but satisfyingly fruity, and also well priced at about $15. Though we skipped it on that particular outing, Horton's Norton (pictured right) is also perennially solid for under $15, as well it should be, being the first commercially released example since prohibition. I could go on, but honestly, we were in such a rush and I consumed so much wine that my memory is a bit fuzzy. Suffice it to say that a winery that offers such a breadth of esoteric wines, and is willing to let the public try them on the house, is a bit of an anomaly. I have no doubt that a good number of the wines are mediocre at best — that said, the best way to learn about wines is to taste as many as possible, and Horton offers a unique opportunity to get a good number under your belt. Though, even if you are spitting, a designated driver might be in order. Again, please chime in with your own experiences at these and other Virginia wineries. Cheers, and keep drinking locally! Winery pictures courtesy of the respective vineyards' websites. Step aside California, Virginia has an Orange county, too; though, unlike its west coast counterpart, our OC is not full of beautiful people making each other miserable, but beautiful countryside, and enough wine to keep anyone happy. The area around Charlottesville is one of the fastest growing regions in Virginia winemaking, and to the northeast, in beautiful Orange county, is where a lot of it began. Before anyone had any confidence in the ability of Virginia to yield great wine, passionate winemakers staked their claims here, with several still thriving more than thirty years later. Here are my experiences at some of the wineries in and around Orange county. Even if you are not a wine lover, but say, an armchair historian, Barboursville has plenty to offer. Just down the hill from the grand tasting room and winery facilities are the Octagon Ruins, the remnants of a 19th Century estate designed by Thomas Jefferson himself. Afterwards, the food lover may retire to the award winning Palladio Restaurant, which offers a small but constantly rotating menu of Italian and southern cuisine of the highest caliber. For the organically minded, Palladio is a dream; all their meat is sourced from the highly regarded Polyface Farms, and many herbs and vegetables are harvested from the adjoining garden. I have only eaten there once, and I have to say the meal was excellent, but very leisurely — plan to be seated for several hours, and be sure to make reservations several weeks in advance. As lovely as the ruins and restaurant may be, the main show at Barboursville is most certainly the wine. Barboursville offers a brilliant array of some 20 wines, including such Italian classics as Pinot Grigio, Barbera and Nebbiolo. Winemaker Luca Paschina, informed by his Piedmontese background, produces wines of a decidedly Italian character, high in acid and food friendly. For a modest $4 fee (which is waived with wine purchase) the bar offers a sampling of about 16 wines. The whites are universally appealing, and the dry Rose is particularly noteworthy for its balance of strawberry fruit and acid. The reds, too, are all top notch; the Barbera amazes me year after year with its varietally correct cherry and tomato flavors — it actually tastes Italian, a feat no California producer has replicated in my experience. Undoubtedly the greatest treat of the tasting is the winery's flagship red, the Octagon, an homage to the Ruins and Jefferson's dream of producing world class French style wines in that very region of Virginia. This Bordeaux blend incorporates Merlot, Cabernet Sauvignon, Cabernet Franc, and Petit Verdot in the 2004 vintage, the wine's seventh incarnation. On the nose and palate it is classic right-bank Bordeaux, with black currant, coffee, and earth leading to a firm and bitter tannic finish. Though young and a bit expensive at about $40 a bottle, this wine is easily one of the most age worthy in Virginia, and will certainly provide years of pleasure to any wine fan willing to take the chance. Food: Palladio Restaurant — reservations available online, or call (540) 832-7848. Wine Availability: Widely available in Virginia and DC. Burnley will always hold a special place in my heart as a figurative port in the storm. Orange county is vineyard and horse farm country, and as such, is all but bereft of the usual amenities. So when my girlfriend Eliza and I found ourselves driving through the gorgeous countryside, suddenly beset by ravenous hunger and casting about in vain for a Sheetz or a Wawa, we pulled out our Virginia winery map (available for free at most wineries) and hoped for a miracle. "Well, there's a place called Burnley about seven miles from here"
"We'll have to risk it!" And so we found ourselves driving 50 mph on the highly rural Route 33, stomachs growling. We pulled off the main road, wound up a glorified cow path, and pulled up to the hill set raised ranch that is Burnley Vineyards' tasting room. We rushed inside, eyes shifting and desperate, and practically before we were even greeted set upon the complimentary oyster crackers like wolves. "Would you like some cheese and a warm baguette?" The man behind the bar asked. "It shouldn't take but 10 minutes." We nodded, embarrassed but grateful. Partially sated with starch and salt, we spent the time while our bread warmed to sample Burnley's wines. Where its neighbor Barboursville, which was founded in the same year, has gone upscale, Burnley has remained homely. I don't mean this in a negative way — Burnley is homely in the very best sense of the word, from the tiny wood burning stove in the corner, to the screen porch decked out in patio furniture, to the owner's Belgian Shepherd, Cooper (a certified Wine Dog), sniffing about the patrons. 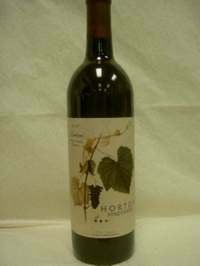 The wines have a similar, honest quality — table wines of fair quality at fair prices. Amongst the usual Chardonnay (which was bad) and Cab Franc (which was good), Burnley offers an assortment of fruit-flavored and spiced wines which, though not likely to impress your more cosmopolitan friends, may make great gifts for that aunt or cousin who drinks Arbor Mist and whom you'd like to introduce to the finer things. Once our baguette was warm we retired to the porch with it, a bottle of Primitivo (our favorite of the day), and a couple of very nice local cheeses, which we enjoyed thoroughly. Cooper, it must be said, was also a big fan of the cheese — no wonder his coat is so shiny! Food: Bread and cheese available for purchase. Wine Availability: Limited availability within Virginia. Stay tuned for part two next week. As always, if you have had notable experiences at any of these wineries or with their wares, please chime in. Oh, and if you have a favorite winery that you think I should visit, I'd love to hear from you! Pictures courtesy of the respective vineyards' websites. Map courtesy of virginiawines.org.